It's hard to believe but the 2018-2019 school year is almost over! Start making plans for 2019-2020 by checking out the FMS school supply lists for next year. Click on the headline to download a PDF copy. Students who are being inducted into the NJHS must return paperwork by Monday, April 15th. You can still order a copy of this year's yearbook online for $35.00. The deadline for customization has passed, but you can still get a guaranteed copy by placing and order now. We will have a limited number of extra yearbooks for sale after our distribution in May. These extra copies will sell for $40. Order today! 6th and 7th graders, If you plan on trying out for the FMS Cheer Team next year you must attend one of the meetings next week with a parent. The meetings will be Monday OR Tuesday starting at 5:30 in the FMS Cafeteria. You only have to attend one of the meetings. Any 8th graders interested in trying out for the 2019-2020 FHS Tigerette Dance Team, must attend a mandatory tryout meeting next Tuesday, February 26th at 6:00pm in FHS room 117. For more information pick up a tryout packet in the FMS or FHS front office. It seems so far away, but we are planning now for the 2019-2020 cheerleader tryouts. Packets are available in the FMS front office for this year's 6th and 7th graders. Stop by and pick one up for your student, or have them come by the front office during passing periods or before and after school. It's time to sign up for our UIL academic contest season. Students can sign up for more than one event and is open to all middle school students. See the linked flyer for more info. Come join the fun! 7th & 8th grade soccer games scheduled for 3/4/2019 have been canceled. Due to weather conditions at game time, all 7th and 8th grade soccer games have been canceled and will not be made up. Thanks for a great season Tigers! Mrs. Fluman's 7th grade math classes were solving a mystery on who stole Santa’s cookies! 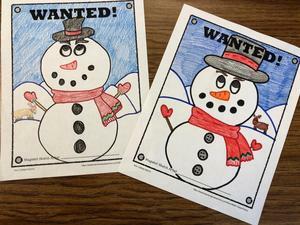 They had to solve similar figures proportion problems and then sketch out “Frosty’s” mugshot to solve it. Super fun! 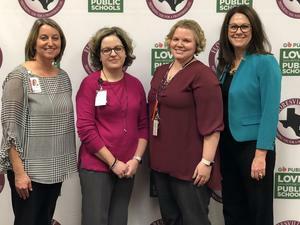 At the November FISD Board of Trustees meeting, FMS Visual Arts educators, Megan Aguilar and Erin Ashenbeck were featured in the “Innovate to Educate” portion of the meeting. Both teachers were recipients of Future Ready Teacher Grants that placed Chromebooks in their classrooms. They showed how creating a blended learning environment that includes choice boards, learning menus, google classroom, ThingLink, along with other apps and websites promotes student engagement and learning. They shared how students used these innovative digital tools in combination with traditional tools to create an art piece for Dia de los Muertos or Day of the Dead.